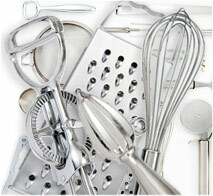 It's time to take stock of your kitchen tools and utensils and make sure everything's in working order. We'll review some kitchen gadgets we like and give you a few tips on finding the perfect kitchen gear. Check out some kitchen tools you can't live without. If you’re looking for recipe ideas, check out our recipe section. And if you're searching for handmade gift ideas, check out the crafts section. Profiteroles, better know as cream puffs, are a delicious dessert and super easy to prepare. Check out other books in our Cookbook Library.